Daily keys that on average should net you around 20-60k AD per day. With the chance at getting rare items like mounts, worth millions of AD. Summon Mailbox, save more time. Getting to VIP rank 8, for the no auction house fee bonus is vital if you want to make money by re-selling on the auction house, but there is little benefit of going past rank 8. See more about investing on AH further down. Tip: Although it might or might not be against the ToS of the game, you can set up multiple accounts and get VIP rank 1 on them so that you can claim additional keys per day. This can be very profitable. People have been banned in the past for doing this, but this is mostly for usings a very large number of accounts. Be sure to use your utility enchanments and Wanderer’s Fortune to make RP. The more RP you make yourself, the less you have to spend on it. You can also use that RP to refine enchantments that you can sell. See our Refinement Guide for more info on refinement. I currently use x3 Dragon’s Hoard, x1 Quartermaster’s and x1 Fey’s Blessing, along with a mount with Wanderer’s Fortune. The Griffon mount is a good mount to get Wanderer’s Fortune. If you play a lot on your character you acutally only need one of each enchantment as you will hit the cap. Refining Rough AD is the meat and potatoes of AD making, and you should aim to hit the cap as often as you can, preferably every day. As of Mod 14, Ravenloft, the cap for Rough AD is 100k for the entire account, as opposed to the previous cap of 36k for each character. While this might first seem like a bad thing at first, it really isn’t. Given time this change will lower the prices on the auction house and items will be cheaper and more accesible to normal players as AD farmers aren’t flooding the market with as much AD. It also makes the whole refining process a lot less time consuming and cuts down on all the micro managing between multiple characters. Tip: Remember to Invoke when you can. Invoking will give you a Rough AD bonus. 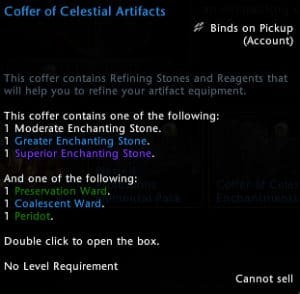 You can get Coalescent Wards from invoking which can make you 500k AD, read more about that below in the Converting Currencies section of the guide. The in game queue system used to make rough AD. To reach the cap, play through all the queues you have available to you. More queues unlock as you progress through campaigns. 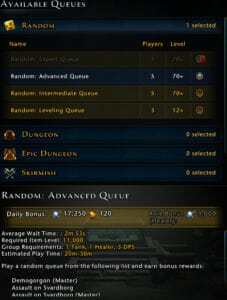 For AD purposes, I recommend only running the queues once a day, as the repeat bonuses generally aren’t worth it. Queues also sometimes reward extra AD for Healers or Tanks. After doing your queues, you might still need some rough AD to reach the cap, so here is where salvaging comes into play. Salvaging has been removed from the game as of mod 15, instead you get some rough AD from the chests at the end of dungeons. The Reward Reroll Tokens also made it easier to get valuable items from chests that you can sell for AD. Kessel’s Retreat and Shores of Tuern are both very easy and fast. Only takes about 5 minutes to complete, and depening on how many keys you have, you get one or two chests. Demogorgon, both regular and and Master, are very quick to run these days, and are usually completed within minutes. Spend all your leftover Faerzress on keys for the chests here. Temple of the Spider is also fast and profitable to run. Seal of the Brave: Exchange 100 Seals for 100 AD at the Vendor. Adventurer Seals: Can be used to buy 500 rough AD from 500 seals from the vendor in PE. And at last there are a few weekly quests thaat can be completed that reward you with 4500 AD each, these quests are pretty quick, but the AD gain isn’t massive. 2x Refining Stones: Use these events to open up all your containers from Leadership and you Abandoned Gear and Spoils of War from your Quartermaster’s Enchantment. 2x Profession XP and Resources: Use to level your Professions on your alts. And most importantly to farm items from the Explorer’s Charts, see below for more info. 2x Influence: Use to farm guild marks, see section about Explorer’s Chart Farming below for info on how to make money of guild marks. Trade Bar Discount: Use to purchese various items to resell on the Tarmalune Trade Bar store. Some seasonal events can reward you with some valuable items but they usually are not worth farming for AD purposes. If you have cash to spend, you can buy Zen to convert to AD or items that you can sell for AD. To get the most value for your money when doing this, I recommend that you wait for a Zen sale and / or use your discount vouchers that you get from Invoking. You can also spend your Zen on Enchanted Keys and open lockboxes but unless you get lucky and use discounts, just converting the Zen to AD might be smarter. Most of currencies in the game can be used to make AD, although some are better than others. For most players, Masterwork Professions (see further down), is just too much work and too expensive. But you can still make a profit from farming and selling the resources needed by the Masterwork recipes. The profitability of this varies a lot as the prices of the different resources change. As of mod 14, the prices are down, at least on PC, so waiting for further updates might be best. Explorer’s Charts are bought from the Generalist in your guild stronghold. Before you start farming, check which resources fetch high prices and farm acordingly. To really take advantage of Explorer’s Chart farming, you should also use events to your advantage. Donate to your guild during 2x Guild Mark events, and save up the Explorer’s Charts for the 2x Profession resources events. After a 2x Proffesion event, wait a while before selling the resources, as the prices will likely drop during the event. After you have refined all of your own gear, you can start using your leftover RP to refine enchantments that you can sell on the AH. You don’t have to refine enchantments very high up to make a profit, and just buying rank 5’s and refining to rank 7 or 8 can be profitable, as long as you farm all your own RP and don’t have to buy it. Some enchantments are more profitable than others, and the normal ones like Azures, Darks etc, are the least profitable. Black Ice and Brutals tend to be pretty good choices, but prices vary to check the Auction House to find out which enchantments sell for the most. Having a spreadsheet with all the costs can also be very useful to figure out how much you are making per enchantment. Simply write down how much you are spending on refining enchantments from rank to rank, and compare with how much you can sell it for. See our Refinement Guide for more info on refinement. You get Celestial coins the first time you invoke each day on each character. Once you have 11 Celestial coins, you can spend them on coffers that can reward a Coalescent Ward. RNG is a big factor here so you won’t be getting these a lot, but the more characters you have, the better your chances are, so remember to invoke at least once on all your characters. To make money from these Coalescent Wards, you will want to Armor or Weapon Enchantment shards. These only cost a few hundred. Find out what enchantment currently sells for the most, buy a shard, then use your Coalescent ward to upgrade it, and profit. Seal of the Brave: Quickly stacks up from doing dungeons and events. Gold: Make into AD by buying from vendors and selling on AH. Injury Kits, Mounts and Companions work best. Seal of the Adventurer: Can be traded for rough AD. Tarmalune Trade Bars: Use during discount events to buy Mounts or Companions to sell. Demonic Ichor: Use to buy Drowcraft shirt and pants that can be sold on the AH. The efficiency of farming AD, changes a lot from module to module. During Storm King’s Thunder, you could make a ton of AD by farming Lanolin. When new modules are released, be sure to look out for all sorts of items and currencies that can be farmed for AD. Dungeons can also be farmed, but up until you can do Fangbreaker Island and the dungeons of the later modules, you will mostly be limited to farming for salvage (see further up). Tip: Be sure to use leftover campaign currencies to buy keys for various dungeons. In some cases like the later dungeons, farming campaign currencies to get more keys is vital. Also remember to claim your daily keys from VIP and get you daily free key from the Dungeon Chest Keymaster in PE. Fangbreaker Island, Spellplague Caverns, Tomb of the Nine Gods and Castle Ravenloft are only accesible to end-game players but when you get to this point you can farm these dungeons for valubles like masterwork resources and Ultimate Enchanting Stones. Illusionist’s Gambit can be farmed for companion gear that can be sold or salvaged, some of it sells for millions of AD but is very rare. Farming and selling Hunt Lures and Wanted posters can be profitable, but prices vary a lot, so check those first. Currently at mod 14, profitablility is low. Farming campaign items and currencies can be a great source of income, but mostly at the start of new modules, when the prices are high. Currently at mod 14, profitablility is low. Dread Ring daily lair quests: After completing the Dread Ring campaign and getting your Adamantine Gauntlet, go back to Dread Ring every day to get the daily lair quest from Sergeant Knox for a chance at a GMOP or SMOP, along with a good chunk of RP. Only 5 minutes of work. 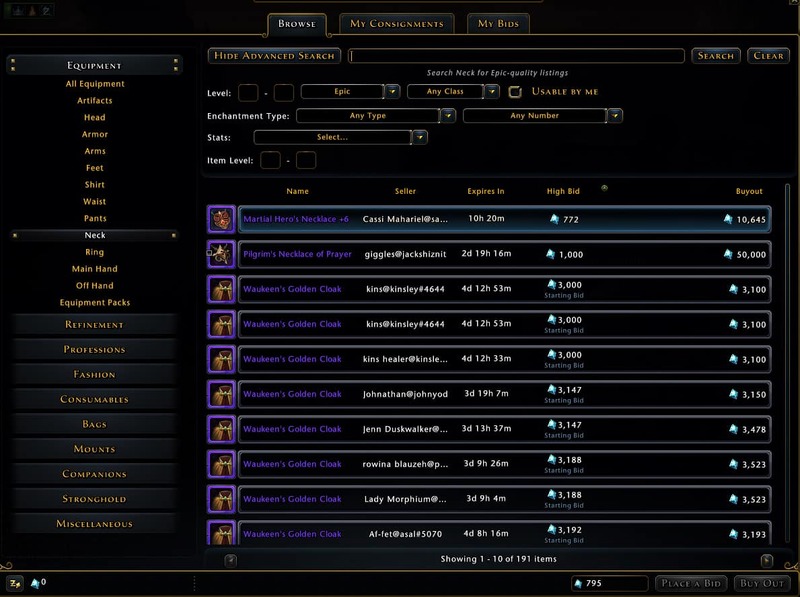 What is the best profession for making Astral Diamonds in Neverwinter? Well, that’s a tough question, and the answer will vary depending on which items are in demand. Professions can be a bit of a pain in Neverwinter, so the easy choice is leadership, altough you can technically make more with other Masterwork professions. See our Profession Guide for the fastest ways to level professions. 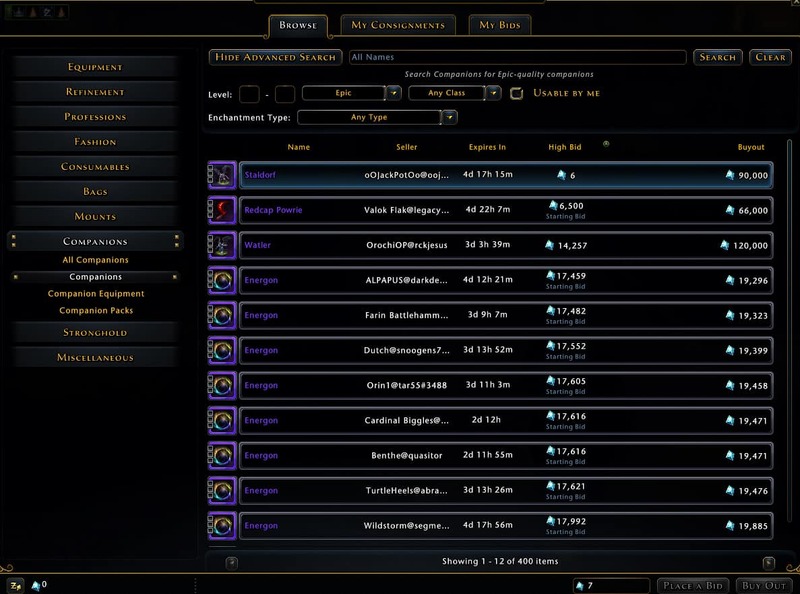 Investing your Astral Diamonds in the Auction House is one of the best ways to make more AD. Do this right and it can mean hundreds of thousands or even millions of AD per day. This can be daunting at first, but once you get the hang of it, it really isn’t very hard. To do this with max profitability, I recommend that you have VIP of at least rank 8, to avoid the posting fee. You will still need to pay the 10% auction house cut, so keep in mind when buying items that you will at the very least be able to sell the item you are buying for 10% more than you bought it for. You most likely won’t be making a profit of every item you buy, unless you have a very good control of the market, but this is ok as long as you are making a profit on a whole. Some items that look like a great deal, maybe isn’t, and you will have to sell at a loss. The more you learn the market, the less mistakes you will make. There are a ton of ways to look for deals on the auction house, and a ton of ways to invest. The most important thing is just to learn how the AH works. Below we will look at the main ways I use to look of deals for reselling. Tip: Save up some AD before you start getting serious about reselling. Having a few million AD to start with works best as you can afford to buy more items and not tie up all you AD in just one or two items. This is perhaps my favorite way of making AD. Basically you are looking for items that someone has priced cheaper than everyone else. This happends more often than you might think. Sometimes people just want to sell an item quickly, other times people just make a mistake and set the price to low. Either way, there are huge profits to be made. You can look for deals like this in any category on the AH, but if you are going to look through all of the it just takes to long to do every day. Usually I limit myself to just look at the categories I have found to be the most profitable, which are Epic and Rare, Companions, Mounts and Artifacts. Click “Name” to sort all the results by name. This way you will get all the same items next to each other with the cheapest option up top. If the cheapest one is much cheaper, like in the examples below, it is likely a good deal. A Cavalry Tyrannosaur at half the market price. Add the 10% Trade House Cut and there is still about 20k to be made off this Black Ice Beholder. A good deal on a Fey Panther. You can also try to sort by buyout in the results and see if there are anything that is priced low that showes up in the search. Another way to find deals is to look for items with low starting bids. This is relatively quick to do, and you can do it with any type of item. However, the lower the starting bid, the more other buyers the auction will attract, so getting the item for a good price won’t work all of the time. Actually it will most not work. But if you get your bids in on a lot of auctions, chances are you are going to get a few deals. Another way is to look for starting bids that aren’t super cheap, but at least 10% cheaper than the average buyout of that item. That way, you can still make some AD and the auction won’t attract tons of other bargain hunters. To find low starting bids, set your filters, then sort by buyout to see if any good deals show up at the top of the search. The Staldorf, Redcap Powrie and Watler are all very good deals at the bid price. Long term investing is the practice of foreseeing the market and buying low, waiting for the market to go up, then selling. This can be done with any type of item, but it requires you to think ahead and to have enough AD to afford buying items then letting it sit in the bank for a while. Prices go up and down for a ton of different reasons but two good way to invest are, during event and as lockboxes change. During events prices for items related to the events will go down, becasue everyone is farming those items and flooding the market. This is a good time to buy items, then sell them a few weeks or months later when prices recover. 2x Refining Stones: Buy enchantment and refining stones during the event, sell after. 2x Profession XP and Resources: Buy profession assets before the event, sell during since everyone needs them to level. Buy resources during the event, and sell after. Trade Bar Discount: Buy items on the AH that are on sale in the Trade Bar store. Items like the Eye of the Giant will go down during the event, and up after a while. Most other events can usually also be used in a simillar way to make AD, just think about what items flood the market during the event. In the end, making a lot of AD is easier than people think. Using the methods above, I make well over a million AD a day. If you can make 100k from your daily cap, 200k from farming and 200k from working the auction house, you are already hitting the 500k mark, or 15m a month. If you have any questions about Astral Diamond farming, let me know and I will help you out! how to transfer AD from differente PG of same account? The way i transfer Astral Diamonds, is that i use the AD/Zen Exchange to buy Zen with. I then sell the Zen for Ad immediately. Then log onto the other character and withdraw the AD.